Running from Albany Place to St George's Court, this short section of the High Street, on the northern side, comprised a distinctive 18th century block of five properties and a couple of properties unusual in having front gardens. One of these, no. 295, was used by a series of doctors for over a century. This part of the High Street was known as ‘High Ground’ (important in an area where flooding was common?). In Mason’s 1853 trade directory, Henry Richards at no. 295 and Miss Saunders at no. 296 are both given an address of ‘High Ground’ rather than ‘High Street’. 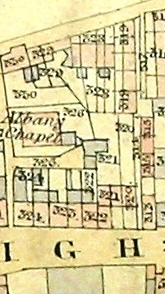 In the 1872 directory published by Walter H. Jackson seven properties – 290 to 296 – are recorded under the heading High Ground and in the 1877 edition the first five – 290 to 294 – are listed as numbers 1 to 5, Albany Terrace. The tithe apportionment 1839/1841, shows 4 properties in this section of the High Street owned by ‘Killick’ but the accompanying map shows a block of 5 adjoining an L-shaped block that could be 4 properties. At the time of the tithe apportionment the properties overlooked Felix Booth’s distillery. 70 years later the 1909/10 Valuation returns show 5 properties numbered 290 to 294 owned by Arthur Killik, 13 Duke Street, London Bridge. The 1909/10 Valuation describes 290 to 294 as ‘old’ 3-storey properties each with a shop, parlour and kitchen and/or scullery and/or washhouse on the ground floor, two rooms on each of the first and top floors. The properties had a wider frontage than average, varying from 17’2” to 18’4” and were valued between £550 and £700. They all needed their back elevations repointing. See links below for two postcards from the early 1900s showing this block, one includes some shop proprietors, so if your ancestor was an owner in the early 1900s you may find them featured. A photo from the 1940s (see link below) shows numbers 290 to 294, a substantial 5 house terrace, pretty much unchanged from the early 1900s images. One of five properties also known as Albany Terrace. No. 290 was a bakers from 1851 to at least 1940; run by Charles Stephens (1851), William Stephens (1861), Benjamin Skinner (1881), Jacob Wickert* from Germany in 1890/1891, Edwin Gregory (1901, 1913, 1928); Edwin Simmons (1933. 1940). In the 1909/10 Valuation returns the ground floor is noted as having a bakehouse (6 bushel oven) and a stable at the rear for one horse and one van. The premises are on the eastern corner of Albany Place. The 1911 census shows Edwin Gregory and his family, which consisted of three girls and a boy aged 10: a nephew, William J Gregory, age 23 and like Edwin born in Hampshire lived with the family. The birthplaces of the Gregory family showed they had lived in Surrey and Sussex before settling in Middlesex. In 1948 no. 290 was owned by Frank Albert Davis (grandfather to Roger Davis). See above for a description of this property. One of five properties also known as Albany Terrace. Montague Price, ‘window glass mt’ is recorded here in the 1841 census, aged 25 (to 29) with Strother Price & Augustus Price, whose occupations are ‘Ind(ependent)’. They had two live-in servants, John & Elizabeth Evens. The property was uninhabited in 1851, then in 1861 Alfred Bissell, marine store shopman, aged just 17 lived here. In 1861 the property was shared by two households, headed by Joseph Huggetts, milkman & James Sansom, cooper. William Borer, clothier, was recorded as having a business on the High Street in 1874 and was at this address in the 1881 census. (An advert in St George’s Parish Magazine, 1898, notes his business was established in 1863). In 1881 he was aged 40 and living with his wife, Mary Jane nee Bowyer (41), whom he married Wandsworth Registration District in 1873, and two small children aged 3 & 1: Frederick Herbert & Mary Emmelia; his mother in law Sarah Bowyer, 73 and servant Eliza Sarah Richardson, 18, completed the household. William Borer’s business continued under his name at this address until (at least) 1928, although he and his family had moved to 27 Boston Park Road by the time of the 1901 census: in 1901 no. 291 was occupied by Henry G Mullens, detective metropolitan police. See above for the 1909/10 Valuation description for the block of which 292 was a part. The only difference noted for 292 was that it had an exit at the rear. In 1911 Charles William Hawkins, his wife Rhoda and three young children family lived at no. 291. Charles was a carman on the railway. As the number of rooms recorded is only four it seems likely that they lived above Borer’s shop. 1933 and 1940 trade directories show E A Borer & Sons, clothiers, at this address. By 1891 Ralph Randall, stationer, and his wife Alice Maud (nee Card) and two daughters lived here with Mary Maclaren, a housekeeper and Steven Hobbs, a printer and lodger who presumably loved on a separate floor. By 1901 the Randalls had five daughters aged 1 to 16. Ralph Randall died in 1906 and his wife was running the stationers shop in 1911 with four daughters still at home. The enumerator for the 1911 census crossed out that Alice had been married 27 years (as a widow it was deemed not relevant; the 27 years may include the 5 years following her husband’s death) and that she had 9 children, six of whom were still alive. The Randall family remained at no. 292 in 1913. By 1928 no. 292 was a newsagents run by Alex Field, then Walter Weymouth (1933 & 1940). In 1890 and 1891 number 293 was a grocers run by Daniel McDonald from Tipperary, Ireland. By 1901 Mrs Martha Bunce ran a confectioner’s shop here. In the 1911 census Albert James Horton, a hairdresser aged 29 and born in Brentford, ran his business from here. His widowed mother Louisa, younger sister Kathleen and brother George (assistant in hairdressing) completed the household. Albert J Horton, presumably the same man, volunteered as an orderly with the Red Cross at Percy Hospital Isleworth from September 1915 to December 1918 (Red Cross website). The Horton hairdressing business continued here as ‘Horton Brothers’ until at least 1933. In 1940 the property was still used as a hairdresser but run by Edgar John Farrington. See Len Cox’s memories of Hortons. Yvonne Carter wrote to say Hortons later re-located to Windmill Road and ‘the grandson of the Mr Horton who ran the shop in the early 1900s is married to my sister-in-law’. William Mountford, excise officer lived next door to Henry Richards in 1841. Excise officers moved to new areas every few years and by 1851 he was living in Chelsea and Thomas Moffitt, clerk & collector of Inland Revenue, born Northumberland, headed a household of 9 here. In 1861 Richard Vound and his wife Elizabeth (both born Barnstaple, Devon) were living here with a niece Elizabeth M Richards (born Barnstaple) and nephew William H Vound, aged 4 and born locally: he was visiting. By 1871 Alfred Metcalfe, a draper born Driffield Yorkshire was living here with his wife Eliza (born Downham Norfolk) and their assistants Harriet Burn, from Glasgow, Scotland and George Shrimpton from ‘Dorcet’ Oxfordshire. Numbers 290 to 294 were described in this census as numbers 1 – 5 Albany Terrace. The Metcalfes remained here in 1881. A 1890 trade directory shows Thomas Harlow, draper at this address. The census the following year shows he, his wife Elizabeth and eldest daughter were born in Burton on Trent, Staffs, their next two children in Derbyshire and their baby May, aged 1, in Brentford. They had a servant, local girl Emma Rye. In 1898 an advert for 'G. F. Edmett (late W. S. Smith) general draper, hosier and milliner, 294 High Street' appeared in St George's Parish Magazine. The 1901 census entry shows George F Edmett, was from Brighton, his wife Eleanor from Stowmarket, Suffolk and they had a housekeeper Susan Payne. Eleanor died by 1911 (census) and George Frederick Edmett and Susan Payne remained living in this 6-roomed property. George Frederick Edmett is also recorded at his address in a 1913 trade directory. In 1928 Joseph C Fisher ran the draper’s shop, in 1933 and 1940 Mrs M Wing. Sources show number 295 was used by members of the medical profession for over 100 years. The earliest record I have is from the Ealing tithe map, dated 21 July 1841 and signed by G H Whalley, Assistant Tithe Commissioner (see left). This shows property refs 321 and 320 with front gardens and thus set back from the High Street. The tithe apportionment records Henry Richards owned and occupied property ref. 321. In the 1841 census Henry Richards, aged 35, a surgeon was recorded here. Next door to Henry lived Elizabeth Hazell. In 1861 no. 295 was occupied by Edward Davis, Kings College London GP, who headed a household of seven including a nurse. He remained here for at least another 10 years. Henry Bott, aged 28, widower, a surgeon born Bourne, Lincolnshire with a 10 month daughter had moved in by 1881. ‘Dr Bott had a chimney fire put out at his home on the High Street, 1888' (N). The 1890 directory records Henry Bott as ‘surgeon, medical officer of health to local board’ and in the 1891 and 1901 censuses he remained at no. 295, a widower in 1901 (the death of a Mary Ann Bott, aged 38, was registered at Brentford in 1899). Opening on to High Street: ½ basement: kitchen, larder, scullery Washhouse; conservatory, WC & fountain in large garden at rear. At the side of the back garden is an old brick built garage & 2-stall stable. The 1911 census shows just three occupants in this 9-roomed property: Hannah Harrison (housekeeper, 51), Lizzie Eliza Lines (cook – domestic – 49) and Ellie Maud Clarke (housemaid – domestic – 19). The census address page shows ‘head of family’ as Dr Bott, presumably he was away from home on census night. A 1913 trade directory records: ‘Henry Bott, MRCS, LRCP Lond., surgeon, & medical officer to Brentford urban district council & hospital superintendent’ at no. 295. By 1928, Reginald Cavan Neil and Alan Dakers Gowans, physicians were using the premises. A 1933 trade directory shows Richard Malam Moore had joined the practice and by 1940 Reginald Cavan Neil had left. Lynn Hayter remembers the dispensary was at the doctors in the 1950s, and that Dr Richard Malam Moore’s surgery was downstairs (in the basement? ), Dr Gowan’s upstairs (possibly main house level) and that a Dr Winocaur was part of the practice and also had a surgery in the same house. A semi-detached house on the corner of George Court, unusual in having a back and front garden. In the tithe apportionment ‘Nathaniel Woodroofe’ is shown as the occupier, John Sanders being the owner of this and the next door property, no, 295. Nathan Woodroofe was the Collector of Excise for the area and died in 1840. Elizabeth Hazell, independent and John Hazell, farrier lived here in 1841. After Elizabeth married her next door neighbour (above), Miss Ann Saunders, fundholder, lived here in 1851, 1861 and 1871. By 1881 Mrs Sarah Brown, aged 60 and a widowed nurse lived here; a Miss Emma Saunders, annuitant was also in the household, possibly the sister of Ann Saunders. 1891 and 1901 saw further changes of occupation, Benjamin Gregory a general merchant, then John Reeder, coal and forage salesman. At the time of the 1909/10 Valuation (in fact the date by the entry is January 1915) J T Taylor of Pine House, Isleworth owned the property and it was let at 12 shillings / week rent. It is described as ‘a semi-detached house of 4 storeys, gardens back and front …substantial dry area was built in front and at rear of house and new drains put in about 1 year ago. Basement damp before dry area made. Fairly old property and in poor repair’. It had a frontage of 19’. In the 1911 census numbers 295 and 296 were recorded together as private houses occupied by Dr Bott.